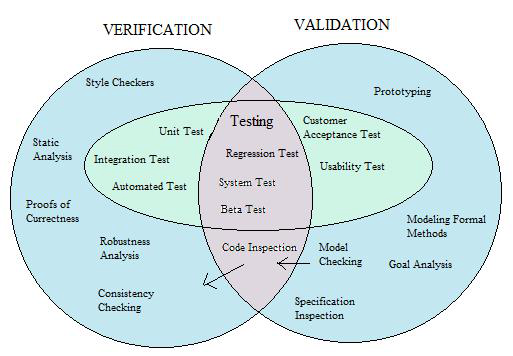 Verification and Validations are terms which induces confusion among software testers. Here in this post, we have tried to simplify the jargon and give you a clear picture of difference between Verification and Validation. We will take an example of car manufacturing process to distinguish between these two terms. Before we delve deep into it, let’s understand that Verification and validation are independent procedures that are used together for checking that a product, service, or system meets requirements and specifications and that it fulfills its intended purpose. So, these two procedures go hand-in-hand to ensure system quality. With this fundamental in mind now, let’s take an example of car manufacturing process. Once car is manufactured in assembly, it is tested in lab conditions and road conditions. Lab conditions verifies that car is made as per its design specifications and is working as expected. However, road conditions test will determine how car will be working in real time environment – its intended use. If you have guessed it by now, lab condition here is verification and road condition is validation. Here’s how. In other words, validation ensures system meets its intended use(road conditions in our car example) by executing of code. While verification ensures system is built according to specifications(lab conditions in our car example) without executing code. Now, let’s see what activities will be done in verification and in validation. Check out below image for visual illustration of difference between verification and validation. We hope the above article sheds some light about difference between verification and validation. Let us know how it goes for you in comments.